Steamboat Geyser has produced several eruptions of between 300 and 400 feet in height. Steamboat Geyser: Photograph of Steamboat Geyser of Yellowstone National Park erupting in 1961. Photo by E. Mackin, National Park Service. Related: What is a Geyser? Which Geyser is the World's Tallest? Steamboat Geyser in the Norris Geyser Basin of Yellowstone National Park has produced several eruptions between 300 and 400 feet in height. These eruptions have been taller than those produced by any other active geyser. It can be called the "world's tallest geyser." Steamboat Geyser usually erupts infrequently, with events occurring many months to many years apart. However, the geyser has been extremely active in 2018 and 2019. Between March 15, 2018 and January 16, 2019, it has erupted 34 times. The last time it erupted more than once in an entire calendar year was in 2003, when there were 3 recorded eruptions. Historically, many years usually pass between eruptions. For more information about the 2018 eruptions, see the Yellowstone Observatory articles: Recent Water Eruptions at Steamboat Geyser and The Steamboat Geyser Eruption of June 4, 2018: A personal perspective. This table has been compiled using data from the National Park Service  and GeyserTimes.org . Steamboat Geyser: Photograph of the steam phase of an eruption on March 16, 2018. Photo by Behnaz Hosseini, National Park Service. Historically, eruptions at Steamboat Geyser are rare and usually small in size. The typical eruption reaches a height of 40 feet or less. It also erupts infrequently and on an unpredictable schedule. There have been less than 200 recorded eruptions since 1878, with an eruption interval that ranges between four days and fifty years. Because of the infrequent and irregular eruption schedule, careful measurements have not been made of most eruptions. Some eruptions have been seen by only a few people and some have occured at night. Their heights have been estimated from the descriptions of witnesses and from rare photographs and videos. Steamboat Geyser - Steam Phase: Photograph of the steam phase of an eruption at Steamboat Geyser of Yellowstone National Park. National Park Service photo. Major eruptions at Steamboat Geyser begin with water jets from two vents followed by a major blast from the main vent that reaches heights of between 300 and 400 feet. In addition to mineral-rich steam and water, eruptions produce large volumes of mud, sand, and rocks. Up to 700 cubic feet of debris can be produced from a single major eruption. Trees near the geyser have been broken by falling debris, and their trunks have been undermined by torrents of runoff water. The water phase of a major eruption can last for up to 40 minutes. Then the geyser continues with a roaring steam phase that can last between several hours and a few days. Waimangu Geyser, New Zealand: Eruption photo of Waimangu Geyser, near Rotorua, New Zealand. 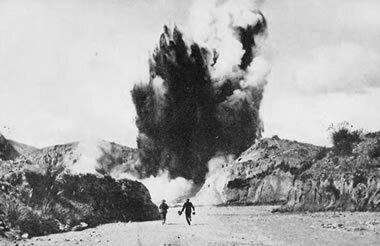 Waimangu was active between 1900 and 1904. It was named "Waimangu," a word in the Maori language that means "black water." This name was used because eruptions usually contained large amounts of rock and soil, giving the eruption plume a black color. Public domain image from Wikimedia. The largest geyser in recorded history is Waimangu Geyser, located near Rotorua, New Zealand. It was observed erupting to heights of about 1,500 feet between 1900 and 1904. A landslide caused the geyser to become extinct in 1904. The name "Waimangu" is a word from the native Maori language which means "black waters." This name was given because eruptions included large amounts of mud and rock - enough to make the eruption plume a black color. Two Yellowstone geysers, Excelsior Geyser in Midway Basin and Sapphire Pool Geyser in Biscuit Basin, have also produced eruptions that exceeded 300 feet. Excelsior was active between 1878 and 1888. Sapphire Pool erupted after the Hebgen Lake earthquake in 1959 and erupted periodically for a few years. Both of these geysers are thought to be extinct. Geyser-like eruptions on Saturn's moon Enceladus: Image from NASA's Cassini spacecraft showing eruption plumes from numerous geysers on Saturn's moon Enceladus. These geysers spray jets of water tens of miles above the moon's surface. 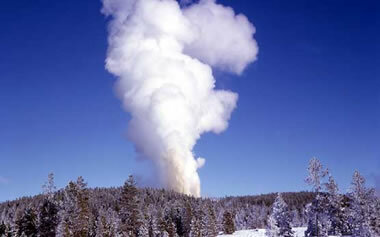 Steamboat Geyser: Article by Yellowstone National Park. Last accessed July 2018. Yellowstone's Steamboat Geyser Roars to Life for First Time in 8 Years: Becky Oskin, article on the NBC News website, November 2015. Last accessed July 2018. Steamboat Geyser: Article on the National Park Service website, August 2013. Last accessed January 2019. 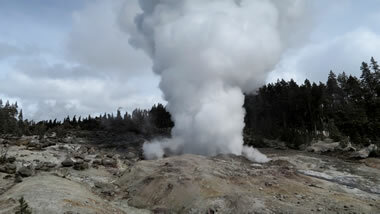 Steamboat Geyser: Recent Activity, table on the GeyserTimes.org website. Last accessed January 2019. Earth is not the only location in the solar system where geysers can be found. 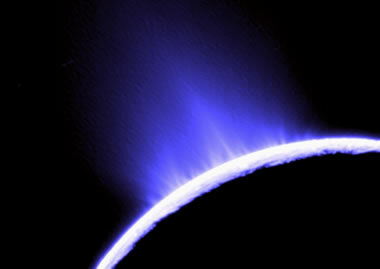 Icy jets of water have been detected erupting from Enceladus, a moon of Saturn, and Io, a moon of Jupiter. These eruptions produce very tall plumes because the force of gravity on these moons is very low. Because these eruptions produce icy water they are known as cryovolcanoes. In 2011, NASA's Cassini spacecraft completed a flyby of Saturn's moon Enceladus. The spacecraft was deliberately flown over a geyser during an active eruption. At an elevation of approximately 62 miles above the moon's surface, Cassini flew through a spray of water particles. These tiny, icy moons produce the tallest known geysers in the solar system. Author: Hobart M. King, Ph.D.